And, knowing Eurolux, will probably die within a year, if not sooner. Why? Eurolux lighting products are pretty good. Their instant start self ballasted CFLs usually reach their 3 years rated life on regular switching frequency. 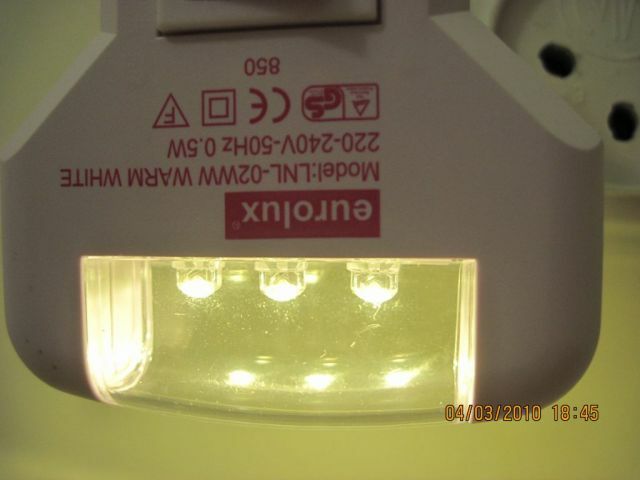 These LEDs like in my blue one are not producted by them. The LEDs can't be overdriven because they are current limited by the integrated electronic ballast. @dor123: The "integrated electronic ballast" in such item is nothing more then series capacitor (intended to limit current as series high reactance) and bridge rectifier. The issue is, then any voltage spike in the mains or turning ON the power create large current surge (the capacitor need high current to follow the high dV/dt slope), what yield to pretty fast LED degradation. So the LEDs actually operating in DC and so are not flickering 100hz. But i think my Eurolux nightlights (Both the blue and 2700K) are operated at AC by HF electronic drivers because they are not degradated yet despite are used long time (The blue is older then the 2700K) and turned on/off many times unlike my chinese unknown brand LED nightlight with integrated dimming PhotoControl (Intensity varied by the intensity of the light from the environment [Like the Inverter technology in Air conditioning]) that degradated in only several months. If they put a ~22ohm resistor in series with the series capacitor, and an electrolytic filter capacitor after the bridge rectifier, there would be no spikes or flickering. Of course this adds production cost so china manufacturers simply throw these away, but I think some of the better quality brands could use the proper circuit. @dor123: LED's might be operated ONLY on DC (they are diodes - they emit light only when current biased in forward). For 0.5W night lights i've never seen HF inverter, but plenty of capacitor + rectifier bridge sources. I meant the parallel capacitor together with the inrush current limiting resistor (something like 22 ohms) in series with mains input, then for 15V LEDs the electrolytic cap could have an ESR of something like 1 ohm. I have a night light just like that but mine is 120volt and is fluorescent.